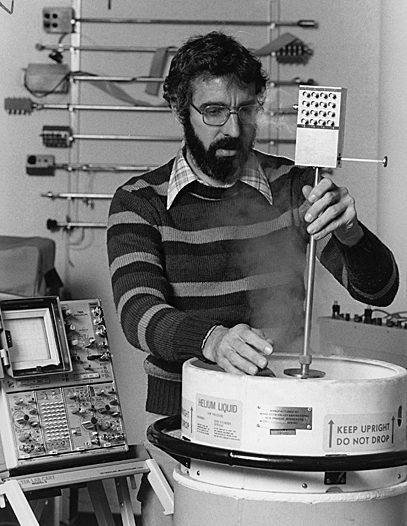 The environmental movement of the 1970s was sustained by many research projects at NIST, which developed standards and methods for measuring all sorts of pollutants in air, water, soil, and sediment. Many NIST innovations-such as an instrument that characterizes microscopic particles in the air and standards for measuring fuel economy and emissions-remain in use today. NIST also served as an objective technical resource and trusted arbiter when asked by the Environmental Protection Agency (EPA) to help resolve one of the most contentious issues of the era-the extent of chemical contamination of the Love Canal area of Niagara Falls, N.Y. The EPA conducted an environmental monitoring program at Love Canal and asked NIST to review the draft analysis for organic chemicals. NIST experts in organic analytical chemistry, quality assurance, and statistics reviewed certain aspects (although not the conclusions) of the draft. They found a number of significant deficiencies; among them, EPA's study design did not permit a comparison of contamination levels at Love Canal with those deemed hazardous or found in U.S. cities. But the Institute also determined that the analytical techniques were appropriate to the general goals of the study and represented the best overall techniques for monitoring organic chemicals in environmental samples. Ultimately, the EPA concluded that no significant amounts of contamination were found except in the immediate vicinity of the canal, in nearby storm sewers, and in the creeks near sewer outfalls. Although the NIST report was critical of some aspects of the EPA study, which was released in 1982, an EPA administrator called it "the most thorough, extensive, state-of-the-art environmental study ever undertaken" and described NIST participation as "essential for the successful completion of the study." Richard Kautz testing the standard he helped develop. Some scientists predicted that such a feat would be impossible. Others tried it and failed. But NIST succeeded in developing a standard for the volt that is more accurate, more stable, and much easier to use than its predecessors. The NIST standard is absolute in the sense that it is based directly on a single, simple equation of physics and thus offers a major advantage over previous standards. It is based on the "Josephson effect," observed when two superconducting materials are separated by a thin insulating film and a current tunnels through the barrier (or junction). When such a device is irradiated with microwave radiation of known frequency, a voltage is induced across its terminals that is related to the frequency and two well-known fundamental atomic constants. The magnitude of the voltage can be calculated readily from the known frequency and constants. It was not easy putting the Josephson effect to metrological use. A single junction produces a maximum output of a few millivolts, much less than the standard device then used by the Institute to represent 1 volt. (For years, the legal volt was maintained on the basis of the "mean electromotive force" of a bank of electrochemical cells, a value that drifted over time and between labs.) Then in 1970, NIST developed an instrument based on Josephson junctions that could generate a signal of 2 to 10 millivolts and compared it to the U.S. legal volt with acceptable accuracy. The big breakthrough came in 1984, when NIST demonstrated the first practical array of Josephson junctions at the 1-volt level. (The photo above shows the standard undergoing testing.) Two years later, a 10-volt standard was developed. With almost 20,000 junctions, it was, for a time, the largest practical superconducting circuit in the world. Today, at least 40 national standards laboratories, military organizations, and private companies worldwide rely on standards based on NIST-developed technology to calibrate voltmeters. Products made with these instruments range from compact disk players to missile guidance systems. 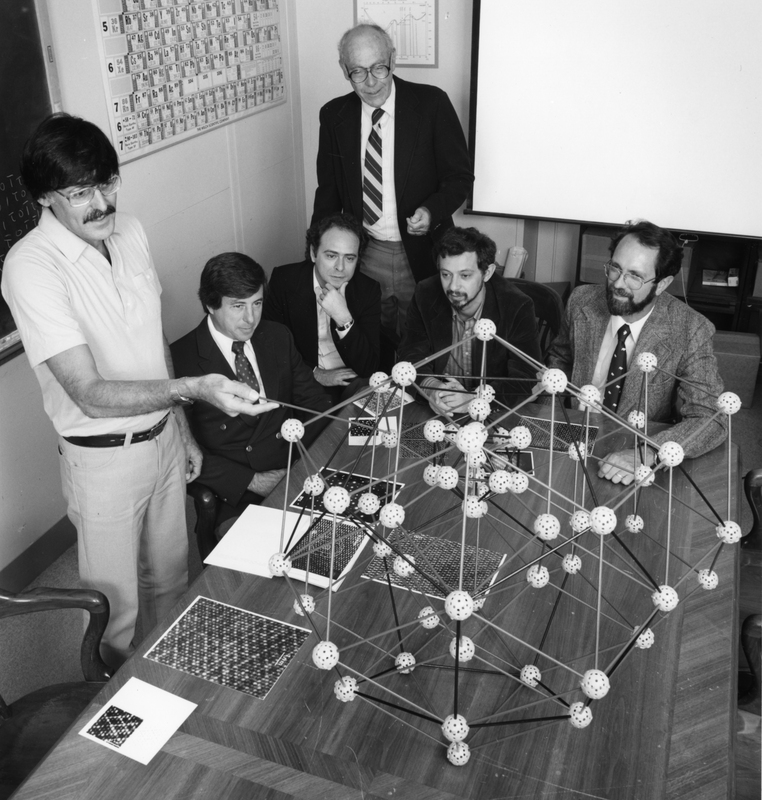 Meeting at the National Institute of Standards and Technology (NIST)* in 1985 just months after shaking the foundations of materials science with publication of his discovery of quasicrystals, Dan Shechtman, winner of the 2011 Nobel Prize in Chemistry, discusses the material's surprising atomic structure with collaborators. From left to right are Shechtman; Frank Biancaniello, NIST; Denis Gratias, National Science Research Center, France; John Cahn, NIST; Leonid Bendersky, Johns Hopkins University (now at NIST); and Robert Schaefer, NIST. *NIST was known as the National Bureau of Standards at the time. When a peculiar arrangement of metallic particles first appeared under an electron microscope at NIST, scientists thought it was a mistake. It was unlike any of the 230 crystal shapes described in reference books. But the pattern turned out to be a true reflection of the structure of a "quasicrystal"—an entirely new material. The discovery of quasicrystals by NIST guest researcher Dan Shechtman (one of hundreds of guest researchers who collaborate with NIST scientists and use the facilities every year) was reported in 1984 by a team that included Institute scientist John Cahn, who subsequently developed models that enhanced understanding of the crystallography of these materials. The 1984 paper was cited 2,330 times in other publications by 1998, evidence of its wide influence. Although initially skepticism was rampant, and alternate models of the structure were proposed for several years, quasicrystals eventually rewrote the rules of crystallography and spawned a flurry of activity in materials science, physics, and mathematics. Cahn later won the National Medal of Science, the nation's highest scientific honor, for his lifetime contributions to the fields of materials science, solid-state physics, chemistry, and mathematics. The breakthrough was "pure serendipity," in Cahn's words, an unexpected boon of NIST research on the thermodynamics of rapidly solidified alloys. The researchers intended to cool a molten metal so fast that it would not crystallize in the usual manner. To their surprise, the aluminum and manganese atoms formed orderly structures that, unlike ordinary crystals, did not repeat at fixed intervals. More than just an academic research topic, quasicrystals have practical uses because they are hard, lightweight, low friction, non-stick, non-scratch, and inexpensive. By the late 1990s, they were being commercialized as coatings for kitchen cookware and hardening agents for steel medical instruments. Many other uses are expected. The Earth is better protected from the sun today thanks to NIST research and data programs, which have helped to both define and solve the problem of chemical damage to the protective ozone layer. Fundamental research by NIST in the 1970s underlined the damage caused by chlorofluorocarbons (CFCs) from aerosol propellants and refrigerants. NIST and the National Oceanic and Atmospheric Administration used laser spectroscopic techniques developed at NIST to identify and measure critical chemical reactions and then input the results into a computer model of the upper atmosphere. Because of this research, damage to the ozone layer from fluorocarbons was estimated to be three times greater than previously assumed. With more than 50 years experience in providing industry with data on the physical properties of refrigerants, the Institute responded to an international agreement to phase out ozone-depleting compounds by launching a major effort to identify and characterize alternatives to CFCs. In 1989, NIST introduced REFPROP, a standard reference database of the thermophysical properties of alternative refrigerants. The Air Conditioning and Refrigeration Institute and the Electric Power Research Institute adopted REFPROP as the source of critically evaluated data for their alternative refrigerants evaluation program. The database, which has saved industry millions of dollars, is a prime example of how NIST and industry work together to successfully meet needs for reliable technical data. Today, CFCs are being replaced by newer, less damaging refrigerants. REFPROP has proven especially valuable in the evaluation of refrigerant blends, such as those now used in some home air-conditioning systems and heat pumps. NIST has distributed widely used software that models important engineering aspects of the use of new refrigerant blends. In addition, Institute refrigerant data were used to validate the choice of an alternative refrigerant used in a wide variety of refrigeration and air-conditioning systems, including those in newer cars.